Today is national Shrimp day! I had no idea until last week! This shrimp recipe is so tasty and different than any I have tested to date. The avocado puree makes a nice dip when the shrimp is served as an appetizer. You can also make them without the dip for a main course. I do recommend if you try this recipe that you try the complete cilantro lime shrimp with avocado puree as laid out below. That way you aren’t missing out and you’ll know how well they are paired. This recipe is not only contributed by Amy Densmore but it is also in her amazing cookbook: The Paleo Cupboard. I highly recommend you check it out. I found it on Amazon. Of course I saw the news buzz last year when she was about to launch her book too. 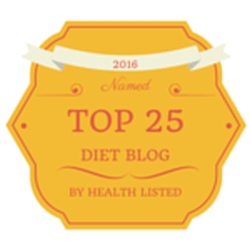 Be sure to not miss out on a delicious paleo dessert to round out this meal. I suggest either my paleo peach mango ice cream or my raw, paleo apple pie. Enjoy! Place the avocados, coconut cream, lime juice, salt, and pepper in a blender or food processor and puree for 20 seconds, or until smooth. Combine the cilantro, cumin, garlic powder, salt, pepper, and olive oil in a medium-sized mixing bowl. Cover and allow the shrimp to marinate for 10 minutes in the refrigerator. While the shrimp marinates, soak 6 bamboo skewers in water and preheat the grill to medium-high heat. Thread the shrimp onto the skewers and drizzle with the lime juice. Grill for 3 minutes on each side, or until the shrimp is cooked through. 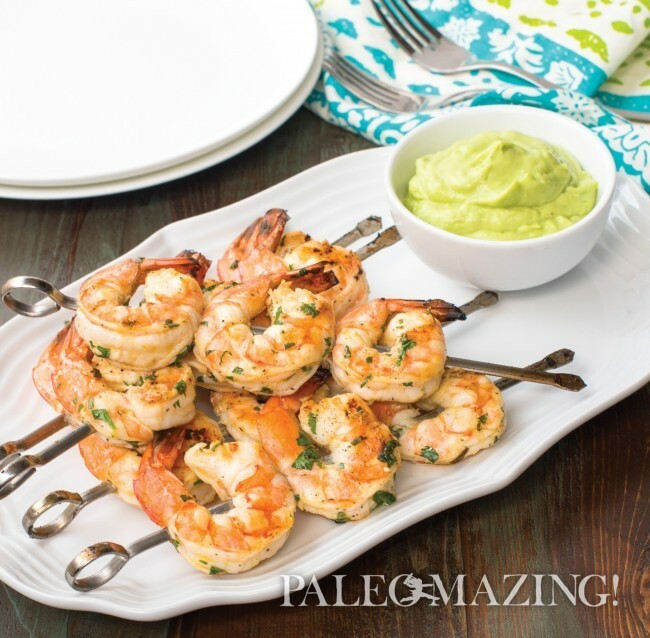 Serve the shrimp on a platter with the avocado puree or on the side for dipping. Try adding one sliced and seeded jalapeño to the avocado puree before blending. Discarding the seeds from hot peppers reduces the heat a bit and allows the pepper flavor to shine. Avocados have been selling fairly cheap where I’m living right now. So I can’t get wait to try that puree out! Love these recipes 🙂 I’ve been eating healthier after reading some reviews on some good recipes from eatwellsimple.com and have been doing GREAT. I’m seriously considering throwing this dip into the mix with all the veges and meat I’ve been using. Thanks so much for sharing!! This avocado dip is delicious with veggies and all kinds of meats. Extremely versatile. Enjoy the recipe!